Fears are growing that Europe could drop its 50-year commitment to a level playing field for business in a new treaty to reform the European Union. A reference to "free and undistorted competition" was pulled from the draft after French pressure late on Thursday. The new text talks of a "social market economy aiming at full employment". If approved, the treaty could undermine the European Commission's efforts to break up monopolies in the name of consumer protection. 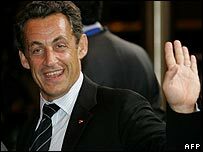 The French President, Nicolas Sarkozy, used a late night press conference to confirm that the EU's 50 year old commitment to an "open market economy with free competition" had been dropped from the draft treaty. "There was some play on that, but today's Presidency document satisfies our demands," he told reporters. If the treaty is approved by the EU's heads of Government and comes into force, it will be treated by the European Court of Justice as the ultimate guide to what is legal in the twenty-seven states which are members of the bloc. In recent years, the European Union's competition authorities have been among the most aggressive in the world at breaking up monopolies. Airlines, telephone companies and energy companies are just a few of the industries that have been forced to allow their customers to buy the services they offer from a competitor. That has often led to the price dropping in real terms for consumers. But the push for liberalisation has often put EU competition authorities in conflict with national governments, such as France and Germany, whose natural instinct was to protect industries that employed thousands of people. Nicholas Sarkozy had personal experience of this in 2004, when as French finance minister the European Union blocked his attempts to rescue the troubled engineering group Alstom with 3.2bn euros of public money. Now it appears that a number of the EU's member states, led by France and Germany, intend simply to rewrite the EU's governing treaty. In future, lawyers for national Governments could potentially defend a bailout of a failing company by pointing to the objective of "full employment" rather than "free competition" as one of the EU's guiding principles. The apparent change in direction has left free marketeers within the European Union seriously worried. "It is very important that the objectives of the European Union that are going to be restated in whatever comes out in a final text have to show where the real priorities lie," the leader of the British Conservative party in the European Parliament, Timothy Kirkhope, told the BBC. "If those objectives have been changed and given more of a social aspect rather than the vital need for competition, completing the internal market and attacking protectionism, I and my colleagues are very concerned." Business groups, too, criticised the changes. "It is an important aspect of the internal market and we are concerned that it is removed," said Jerome Chauvin, from lobby group Business Europe. The move could create legal uncertainty, he added, as no-one could be sure how the European Court of Justice might interpret EU law in future competition disputes. "You can say it is symbolic but it may have an impact that we should not underestimate." As for outgoing UK Prime Minister Tony Blair and his successor, Chancellor Gordon Brown, there are already a number of so-called "red lines" already on the table - issues on which the UK does not want to compromise. Still, European leaders do not have to accept the exact wording of the treaty amendments proposed by the German Presidency. And the treaty will only come into force if all twenty-seven heads of Government are prepared to agree the final text.